Your organisation's chosen Finance Integration Strategy must be determined, particularly regarding invoicing the NDIA. Finance Configuration must be completed, in order to export invoices to your finance system where required. NDIS Configuration must be completed. NDIS Direct Client Funding records must be entered in the Client's Funding tab. Activities must have the Activity Sign Off performed prior to being available to include in an invoice batch and the subsequent NDIS Bulk Payment Request. The Service Schedule - Activity Schedule Report is designed to assist with this process. NDIS Plan Managed Client Funding records must be entered in the Client's FPM tab for Providers of Plan Management Services. External Invoices must also have the Sign Off performed prior to being available to include in an External Invoice Batch and the subsequent NDIS Bulk Payment Request. Invoice batches (Internal, for invoices for the NDIA and/or External for Plan Managers) will need to be generated, prior to them being available for inclusion in the NDIS Bulk Payment Request file. To generate NDIS Bulk Payment Requests, staff will need the 'Edit ALL Clients Records' and 'View Financial Information' Staff Account Privileges. The available options to select from here depend on how the Configuration required prior to generating NDIS Payment Requests that has been completed. Select the invoice dates that you wish to include. These date filters are generally left empty to include all invoices. Please note, when referring to Internal [Direct] Invoices (for services delivered directly via Activities), the invoice date refers to the date the invoice batch was generated and not the dates of the services delivered. 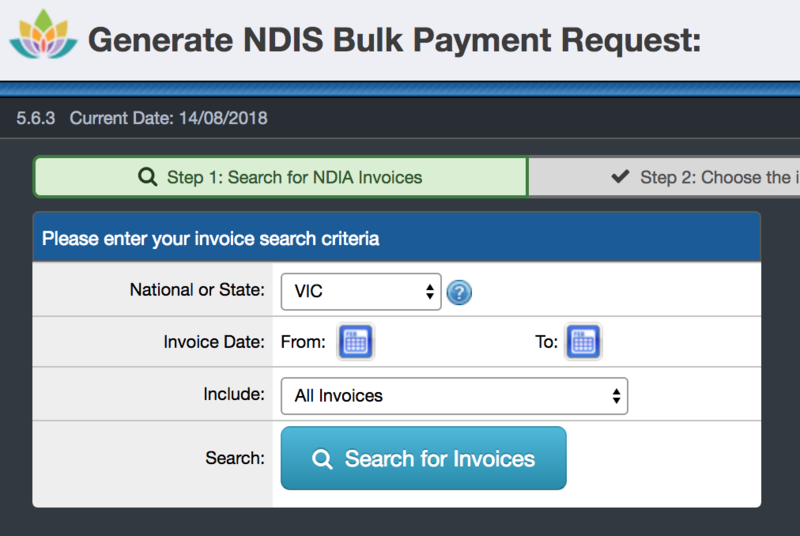 Select the invoices you wish to include and select the Generate NDIS Bulk Payment Request button. N.B. 'Claim Type' is only populated when Support allocations include a Claim Type other than Standard i.e. 'Report Writing', 'Travel' or 'Cancellation'. N.B. This 'old' NDIS Bulk Payment Request file export will be remain available as well as the new, for a limited transitional period of approximately a few months. Regardless of how the time is entered when allocating Supports in either Activities, or External Invoice Items, Support Allocations with UoM = Hours are displayed in the 'Hours' column of the NDIS Bulk Payment Request file export in the required HHH:MM format. This will download the Bulk Payment Request file CSV export to your computer's local hard drive. Please note: there should be no need to open this CSV, however, if you do, please follow the instructions as outlined in the following article: How to open CSV files safely in Microsoft Excel. How is the Claim Reference formatted? 'Formatted Invoice Number'-'Ordering Number of Related Invoice Item on Invoice'. For example, where a single Invoice contains three Invoice Items, they are included as three separate rows in the NDIS Bulk Payment Request file export. Each will now have a unique Claim Reference identifier e.g. INV00068-1, INV00068-2 and INV00068-3. This granular level of identification allows providers to more easily identify any specific Invoice Item/s if errors have occurred. The NDIS Bulk Payment Request is then available to submit to the myplace provider portal. We recommend using the NDIA's Bulk Payment Request Step by step guide. These batches are useful for reconciling against the remittance advice received from the NDIA. When paid by the NDIA, the corresponding NDIS Bulk Payment Request batch contains the invoices which can be marked as paid in your organisation's Finance system.